Added that the W3C staff will monitor for FPWD of extension specifications and update the W3C Validator as appropriate. Clarify that HTML 5.1 and 5.2 may include unstable or proposed features, but are not required to include all of them. Added a process for integration of extension specifications during CR. Added a process which enables early identification and removal of at-risk features. Added that the HTML5 specification status section will be updated to reflect relevant aspects of this plan. Changed to reflect keeping the Alt Techniques document in the HTML WG, and asking the editors and task force to work together to reduce differences. Changed the plan for <hgroup> to reflect the possibility that the early identification and removal of at-risk features might apply. Removed incorrect statement that pubdate exists in the current draft, and added that this attribute could be added in an extension specification. Clarified that the A11y TF can chose to produce multiple extension specifications for the full-transcript issue. Added a list of extension specifications being actively developed. Revise the draft HTML WG charter to indicate an HTML 5.0 Recommendation in 2014Q4 and an HTML 5.1 Recommendation in 2016Q4. Gain agreement that the remaining open issues can proceed via extension specifications at first. Provide an opportunity to merge extension specifications back into the baseline spec upon getting WG consensus and after the extension specifications meet their Candidate Recommendation exit criteria. Welcome the option of extension specifications that don't merge back at all and instead proceed at different paces and possibly even with different Candidate Recommendation exit criteria. Year to date, we've managed to resolve approximately 600 bugs and 28 issues, many by amicable consensus. As we announced on 23 April, at Ian Hickson’s request, we looked to change the editorial team for HTML5. We've put together an effective editorial team who are rapidly coming up to speed. We suffered a short term schedule impact for doing so, but felt it was the right decision to allow us to simultaneously get to REC and continue future work in HTML. We've captured a number of proposed elements and attributes for HTML.next as well as number of efforts were started in order to produce proposals for HTML.next: examples include the WHATCG, the Web and TV IG and the Responsive Images CG. We've moved development of the core HTML5 and HTML Canvas 2D Context documents to github. In the process, we've set up a branch that is updated hourly with the contents of the WHATWG specification. This facilitates cherry picking of changes into the HTML specification. We identified a number of Decision Policy changes which we believe will lead to stabilization and more involvement with the Working Group. We've achieved apparent, but as of yet unconfirmed, consensus on a set of CR Exit Criteria recommendations. The W3C CEO has asked us to contain the date for HTML 5.0 to obtain REC status within 2014. We have 10 open issues, and approximately 300 outstanding bugs which arrived after Last Call closed, with more still coming in. We have 11 Formal Objections as well. This presents a significant risk of infinite regress if we simply proceed to yet another Last Call in response to the previous Last Call, particularly if we remain open to allowing new issues to continue to be raised. The current combination of a monolithic kitchen sink specification, Decision Policy, A11y Task Force, and Formal Objection process has led to a significant number of objections, and current difficulties in achieving consensus. More focus on proposal development is needed to move forward. With all the above considered, we believe that if we were to introduce into this context a compressed schedule in response to the CEO’s push for a REC in 2014, this would inevitably lead to even more Formal Objections and schedule risk. For issues: require actual specification text to be published in the form of extension specifications first, and only after said text meets the exit criteria for CR, consider folding the result into the core specification. To prevent unnecessary confusion, the HTML5 specification will drop explicit indications that any given extension is obsolete once an extension specification exists that has been published as a FPWD. Additionally, the W3C staff will watch for drafts being published and keep the W3C validator up to date as appropriate. Issues that are raised that concern interoperability issues will be considered during as a part of HTML5.0, all others will be considered in the HTML 5.1 timeframe. As needed, split out controversial or unstable text into extension specifications. A detailed, issue by issue, list of proposals appears later in this document. As deferring work is common practice, we may simply need to cite ample precedents, and work on the messaging. The W3C team has a proposal [member only link] which details how specs can proceed to REC with dependencies on specs that haven't completed. identifying areas that are known to be interoperable and don't need further tests. identify areas that are known not to be interoperable, and to be removed without the need for investing time in the creation of tests. The initial draft of the HTML5.0 implementation report will be more of an outline than an actual report; at first it may be based more on qualitative assessments of features than on quantitative assessments. But as we get more test cases into the W3C Testing Framework, we will be able to collect more quantitative data on features, and to update the HTML5.0 implementation report, and evolve it into a much more quantitative assessment of all features in the specification. We should use the remains of the editor fund to hire extra resources for the html test suite task force. Additionally, we will identify a date approximately three months before the completion of CR (and therefore in 2014 Q2) which will be the final date upon which extension specifications that obtain consensus and meet the CR exit criteria can be identified for folding into the core HTML specification. For HTML5.1, we can use milestones similar to those for HTML5.0. During this process, we will encourage modularity as a preferred way to approach introducing new features into the 5.1 release. Note that these dates are for the core HTML specification. While all documents will be ready to proceed to CR once the Formal Objections are processed, each can proceed at their own pace. we create an HTML 5.1 editor’s draft which is a superset of the stable HTML5.0. “Unstable” features from HTML 5.0 and proposed features may be included in the HTML 5.1 draft. we create an HTML 5.2 editor’s draft which is a superset of the stable HTML5.1. “Unstable” features from HTML 5.1 and proposed features may be included in the HTML 5.2 draft. We estimate that the FPWD for HTML 5.2 would be in early 2015. Consistent with the W3C’s Principles of Design , we propose a greater reliance on modularity as a key part of the plan to make faster progress. When we speak of modularity, we mean identifying specific features, either proposed or already existing in the spec, and advancing them as separate specifications. We believe there are some misconceptions about modularity and HTML5, so we'd like to address those before we cover how to apply it specifically. There is a widespread belief that HTML5 is “bad at modularity”. It’s true that HTML5 originated is a large specification, and that it originated as a monolithic “kitchen-sink” spec with a grab bag of features. But HTML5 offers powerful hooks for extension specifications. It allows extension specs to define new elements, new attributes, new values for attributes that accept defined sets of keywords, and new APIs. This extension capability has been widely used. As can be seen from the list above, HTML5 has become vastly more modular over time. Many parts of HTML5 have been factored out. And both the HTML WG and other WGs make heavy use of the extension specification mechanism for new features. Some believe that extension specifications are second-class citizens, or somehow “lesser” than the core HTML5 specification. On the contrary, the specifications in the list above are vibrant, active pieces of the Web platform, with significant implementation traction and community credibility. Many extensions recognized as having wide consensus are recognized as part of the default settings of the W3C Validator, so they have an equal footing in validation. In addition, we will work to find ways to promote these extensions as a part of a family of HTML5 specifications. Some dispute whether modularity is technically desirable when specifying something as complex as the client-side Web platform. It may be debatable whether modularity has technical benefits on net. The reason why we are proposing it is for the social benefits that accrue from such an approach. Splitting out separate specifications allows those technologies to be advanced by their respective communities of interest, allowing more productive development of approaches that may eventually be able reach broader consensus. Several times, the HTML WG Chairs ruled in favor of modularity to significant initial controversy. We had a long-running dispute whether HTML5 should adopt RDFa or Microdata as a syntax for embedding structured metadata, or both, or neither. This was a highly controversial topic generating much friction on both sides. The prevailing Change Proposal called for Microdata to be split out, and for RDFa to also remain a separate specification rather than being folded in. After some initial sniping, this ended the controversy; both specs continued to advance in peace. Similarly, the inclusion of Canvas was a highly controversial topic. In the end, the WG and the Chairs got agreement from Ian Hickson to split the 2D Graphics API of Canvas into a separate specification. This too generated initial controversy, as there had been an attempt at a competing spec. Once the controversy calmed down, the spec resumed development in relative calm. These documents are proceeding along their own schedule, and with a separate set of editors, effectively offloading the work. The evidence shows that placing technologies in their own extension specifications, while initially controversial in some cases, has proven to be a long-term benefit for peace and harmony in the end. Community Groups, including but not limited to Web Hypertext Application Technology (WHATWG) Community Group, Responsive Images Community Group and HTML Editing APIs Community Group. The HTML Working Group will consider proposals for future specifications from Community Groups, encouraging open participation within the bounds of the W3C patent policy and available resources. Change the heading for the Second Last Call Process Additions to one reflecting CR instead. Extend the period of review for proposed changes from 72 hours to one week. Define a process for integrating extension specs during CR. Define a process for removing nominated at-risk features early in CR. Indicate that this specification is part of an Open Web Platform Family of specifications, linking to a page (possibly on a wiki) which more fully defines this relationship and links to an evolving set of specifications. The negative tone of discussion has been an ongoing problem which has kept many potential contributors away from mailing lists and teleconferences. We therefore need to be more active in making it clear that anti-social behavior will not be tolerated in the HTML WG. Allow the Task force to propose and/or take ownership of documents such as extension specs that are be jointly produced by the HTML and PF Working Groups. Give the Task Force the authority to create willful violations (overriding of existing specification text) of the HTML5 specification, as long as they are clearly documented as such and communicated. We need to be tolerant of these inconsistencies, and give room (and time!) for the replacement of the editor and the extra encouragement to publish extensions specifications to bear fruit. Give Task Force Co-Chairs a clear mandate to expand participation and foster greater collaboration across different perspectives. In addition, the chairing arrangement is under review. Responsibility for the HTML5: Techniques for providing useful text alternatives document will remain in the HTML WG. The A11y TF and the editor of the alt-techniques document are encouraged to work directly with the editors of the HTML5 document to reduce identified differences, filing new bug reports as appropriate. We will revisit the responsibility of the document after the differences have been resolved to the extent possible. Update the HTML Accessibility Task Force Work Statement to reflect the above changes. Allow the A11y TF the authority to produce an extension spec that defines a longdesc attribute. If such a specification obtains consensus and meets the proposed CR exit criteria by 2014Q2 it could be folded back into the core HTML spec by that time. This can be combined with a solution for issue 203 and/or with work on a purported replacement. We ask those that oppose instating a longdesc attribute to focus on producing a better solution, and meanwhile not oppose those that wish to pursue longdesc via an extension spec or making progress towards demonstrating that it meets the identified CR exit criteria. Revisit in 2013Q4. None of the proposals define substantive changes to the specification. Since those proposals have been written, new editors have been named, they've updated the status sections already, and the relationship with the WHATWG has already changed. That relationship may change again or even several times before we complete CR. Retain the current hgroup language in the spec. Note that a number of shipping browsers implement the syntax, but there is no currently known complete implementation of the semantics. Therefore, hgroup will be marked as an at-risk feature. The procedure for early dropping of at-risk features may be applied to hgroup. As a result, if no reasonably complete implementations are available, it is likely that it will be dropped from the core spec early in CR. Allow extension specs to be written that MAY define new document content, MAY prohibit certain otherwise conforming content (e.g. prohibit use of <hgroup>s), and MAY change the semantics of existing elements. If such a specification obtains consensus and meets the proposed CR exit criteria -- it could be folded back into the core HTML spec at that time. Allow an extension spec to be written that defines a moddate and/or a pubdate attribute. If such a specification obtains consensus and meets the proposed CR exit criteria -- it could be folded back into the core HTML spec at that time. Allow the A11y TF the authority to produce one or more extension specs that includes a full-transcript attribute. If any such a specification obtains consensus and meets the proposed CR exit criteria by 2014Q2 it could be folded back into the core HTML spec at that time. The A11y Task Force is encouraged to converge onto a single solution. Allow an extension spec to be written that defines the various semantics described by the Enhance HTTP request generation from forms change proposal. If such a specification obtains consensus and meets the proposed CR exit criteria -- it could be folded back into the core HTML spec at that time. Allow an extension spec to be written that defines an ilegend element and changes the semantics of the legend element. If such a specification obtains consensus and meets the proposed CR exit criteria -- it could be folded back into the core HTML spec at that time. Get the editors to apply the decision to Provide for canvas location and hit testing capability with an exposed Path object and related alterations to the 2d Context API. Allow the A11y TF the authority to produce an extension spec that defines an alt and longdesc attribute on the media element. Note: this could even be the same specification as the one for issue 30. If such a specification obtains consensus and meets the proposed CR exit criteria by 2014Q2 it could be folded back into the core HTML spec at that time. Allow an extension spec to be written that may define additional attributes that affect the conformance of documents which don't include an alt attribute. If such a specification obtains consensus and meets the proposed CR exit criteria -- it could be folded back into the core HTML spec at that time. 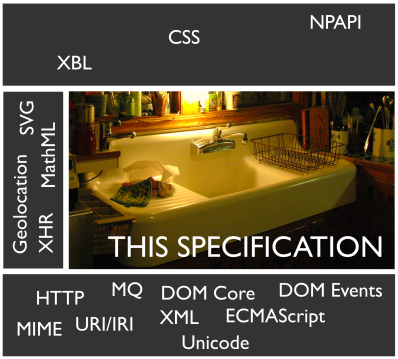 A list of extension specifications can be found on the HTML WG wiki.